Working on JS or is it working me? First off I want to announce that I am currently one day behind in my Skillcrush course. BOO! After creating my modal I moved on to working with the console. 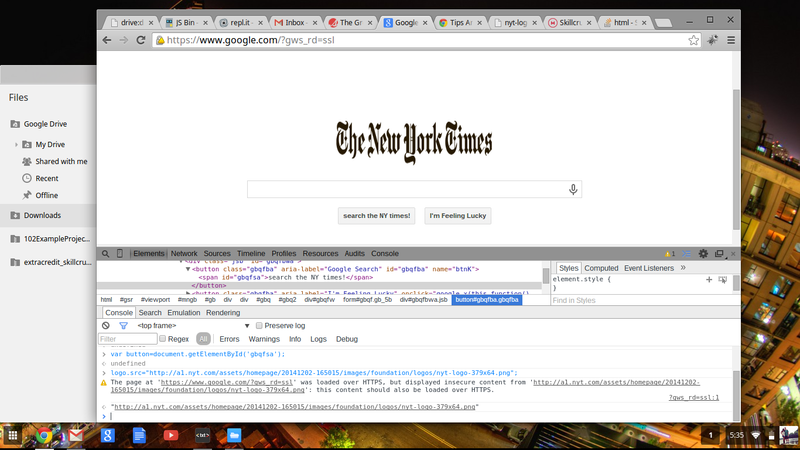 Since I am programming from a Chromebook, I focused on working with the Chrome console. I like that I am able to debug and makes changes using the console. The Great Logo Hijack was an assignment that I really enjoyed. This is the most difficult part of programming that I have encountered. I have worked through some of the problems with my classmates on Mightybell. I really do have a great group of skillcrushers to lean on. On a happy note I am ten days into a Yoga challenge and finding it to center me in the middle of this struggle. Me trying to stay calm..#justbepresent Yogo challenge. Great Blog Erin!!! Love the content & photos!